alaTest has collected and analyzed 10 reviews of LIFX Color 1000. The average rating for this product is 4.0/5, compared to an average rating of 4.5/5 for other products in the same category for all reviews. We analyzed user and expert ratings, product age and more factors. Compared to other products in the same category the LIFX Color 1000 is awarded an overall alaScore™ of 94/100 = Excellent quality. The Lifx Color 1000 floodlight LED is an Alexa-compatible smart bulb with full color controls, robust IFTTT support, and a superb design. $50 per bulb is still prohibitively expensive, especially since you'll probably need more than one of them. They also won't work with Apple HomeKit. Prices are still high on these kinds of color-changing LEDs, but this Lifx floodlight is one of the best. It's worth the splurge if you're into high-tech novelty lighting. The LIFX Color 1000 is a bright, colorful, and easy-to-use smart bulb that connects via Wi-Fi without the need for a hub, but it comes at a steep price. Bright. Rich colors. Easy setup. No hub required. Amazon Alexa, Nest, and IFTTT integration. Highly responsive app. Expensive. No Apple HomeKit compatibility. Well, the Lifx Color 1000 beats them. At $60 per bulb, Lifx is still an awfully expensive smart light. 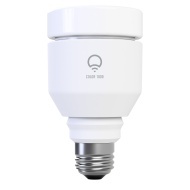 It also won't work with Apple HomeKit (or with Siri) like Philips Hue bulbs will. This flat-topped smart bulb is the most well-rounded color-changer money can buy -- and a superior option to Philips Hue. LIFX was our runaway favorite bulb in 2015, and the company has hardly been resting on its laurels in the year and a half since. Today's LIFX bulbs are smaller, cheaper, and brighter, but are just as easy to install and use as the earlier ones. For years, Philips Hue's high-profile connected LEDs have been the color-changing smart bulbs to beat. The LIFX Colour 1000 is available from the link below for £59.95.